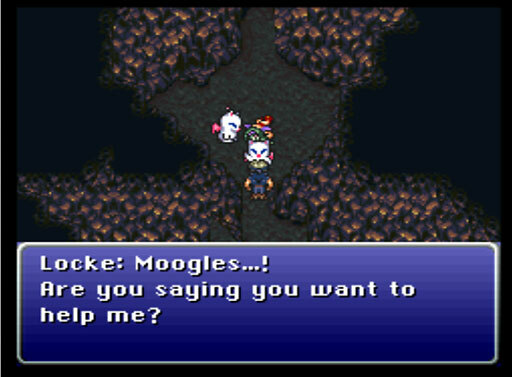 I wondered why there were Moogles hiding out in the Caves of Narshe. Then again, they’ve got underground burrows in FFV where they retreat from the fires. Something else interesting: this is the first Final Fantasy without Dwarves, a race which FF inherited from D&D. Dwarves reappear in FFIX, an “old school revival,” then vanish for good. The Moogles subtly slot into the mythology hole left behind by the Dwarves.